A very useful field guide to the cryptogams (free sporing plants), a group of plants that is often overlooked. Like other guides published by Lone Pine, this one has strong pliable covers, rounded page corners, and matte coated paper-- a sturdy book intended for field use.The book begins with an introduction to the vegetation zones of northwest North America and notes on collection, study techniques and photography. 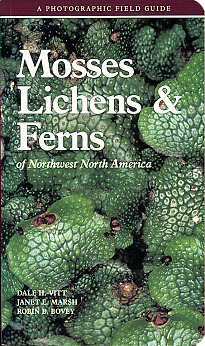 It is then divided into four major sections: mosses, lichens, liverworts, and pteridophytes (horsetails, clubmosses,and ferns). Each section begins with several pages describing the structural features and life cycle with a key to the group, followed by color photographs, descriptions of species, and distribution maps.